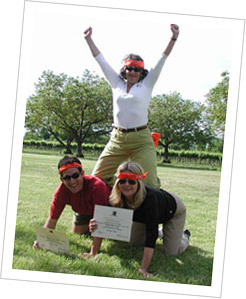 What is the purpose of team building activities at corporate events? For some companies team building activities provide a mechanism whereby our clients' employees can learn to work and bond together in a non-threatening, competitive and creative atmosphere. Groups can accomplish complex, creative tasks while learning about their fellow workers. They learn about each other through cooperative working efforts. Why should my group do a TeamBuilding Unlimited Activity? The finished product in The Dynamic Construction Project and Marketopoly, for example, is always unique and unusual. The product, though, is less important than the process. After the teambuilding activity has been completed and presented to the rest of the group, reflection and review of the process brings out the concerns of each individual corporate culture. How were risks handled? Was creativity lessened or heightened? Can humor and friendship be used to smooth over and deal with important issues? How were hurdles overcome or diminished? What new insights were found by the players? For other companies, the teambuilding opportunity presents a chance for workers to take risks together since the results are not threatening the success of the business. The current marketplace may be causing employees concerns. 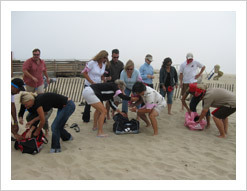 Our teambuilding activities allow uncertainties and unknowns to create growth and mutual respect. 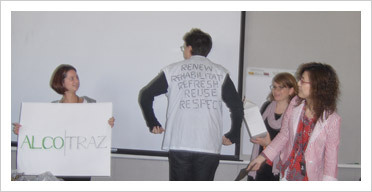 They allow participants to express themselves freely in a way that might be misperceived in the normal workplace. It's amazing how prior to the activity those who thought they couldn't complete "The Project" or that they didn't want to do it, are surprised and proud of what they accomplish. Sometimes a corporate catharsis can be part of the process. No one need claim "mea culpa" to errors committed during the "building" process. Teammates can let themselves go and have the activity become entertainment in itself. Improvement in self-perception is best achieved through accomplishment. In our activities there is no premium placed upon physical stamina and ability. Imagination, creativity and resourcefulness are rewarded. What should a TeamBuilding Unlimited Activity accomplish? Our activities help companies achieve growth, learning, self-understanding and mutual respect. Regardless of the academic achievement and financial status of the participants, the results are amazing and gratifying. When the "work" has been completed, teammates are not only impressed at what their own team has achieved, but what their co-workers create. The final facilitated wrap of the event highlights the process, growth and achievement of each team. Rewards given to selected teams for spectacular results brings pride and satisfaction to each member of the team. Their laughs and smiles say, "We are winners! And so is our company." How successful are TeamBuilding Unlimited Events? Participants are glad they participated and recognize that the "product," although a symbol of their company's corporate culture and success, only reflects the surface. Underneath they have made inroads in understanding their peers and themselves. Occasionally, there are a few people who are unwilling to give of their energy and efforts, but even the toughest can be won over, not by peer pressure, but by the fun of it all! Often those who weren't able to attend have expressed dismay at missing out and hope we work with their group again so they can join in. Even those observers/organizers who say they are only going to watch from the sidelines get caught up in the dynamics of the moment. What new and innovative activities are being tried by your company? We pride ourselves on our imagination to let the direction of the event flow from and with the company?s needs. Each event is researched and uniquely chosen to reflect the client. The events take on an energy of their own. Our main facilitator presents his situation and purpose setting up a situation of why has come to this particular group. Sincerity is important. Our Dynamic model construction, our Marketopoly of new and strange products, our Golf Course Pro Mania and our other teambuilding activities are written for each particular client allowing the group to reach new levels of creative thinking. Participants draw upon skills they have never demonstrated at the workplace before. "Out of the box" thinking is the norm, not the unusual. We make use of a variety of motivational techniques to get the clients in the mood to turn on their creative energy. What type of group works best? We have worked with those who just started in the work place to those on the cusp of retirement, the range of education is from junior college to Ph.D. We have worked with multi-national, multi-ethnic, multi-language groups and gender mixed groups as well as predominately male or female groups. We find that the willingness to take a chance at a new entertaining endeavor is an equally shared prospect. Since all of our events are customized, we will create an activity that is just right for the demographics of your group. Who and why have some companies hired you recently? Some of our most recent TeamBuilding clients include Adobe, Sybase, Chiron, Context Integration, Bristol-Myers Squibb. Many other companies are utilizing our services as they reorganize due to merger or other circumstances. TeamBuilding Unlimited is often hired to boost morale. Teambuilding with TeamBuilding Unlimited gets the results the client wants. Why did you start TeamBuilding Unlimited? 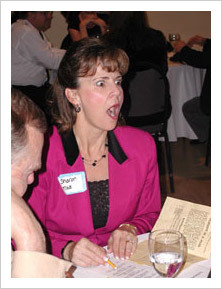 Murder on the Menu has always included an element of teambuilding in our customized mystery events. Our mystery events are teambuilding/problem solving activities with each table working as a team to solve the four or five mysteries which take place during the evening. It was a logical step to other teambuilding activities. Just as our mysteries are customized to reflect the goals and objectives, people and agenda of the meeting, so are our teambuilding activities. With the addition of Franklin Price and his 30+ years of teambuilding experience, we have found our new venture of TeamBuilding Unlimited is a teambuilding experience for us, as well. We are working together as a new team, learning and building on each other's strengths and experiences.